Anyone who has ever played in an orchestra will be familiar with the phenomenon: the impulse for one’s own actions does not seem to come from one’s own mind alone, but rather seems to be controlled by the coordinated activity of the group. 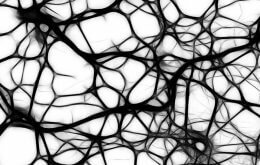 And indeed, interbrain networks do emerge when making music together – this has now been demonstrated by scientists from the Max Planck Institute for Human Development in Berlin. The scientists used electrodes to trace the brain waves of guitarists playing in duets. They also observed substantial differences in the musicians’ brain activity, depending upon whether musicians were leading or following their companion. When guitarists play a duet, the activity of their brain waves synchronises. Scientists working with Ulman Lindenberger at the Max Planck Institute for Human Development in Berlin had already discovered this in 2009. Now they have gone one step further, examining the brain activity of various pairs of guitar players performing a piece of music with two different parts. 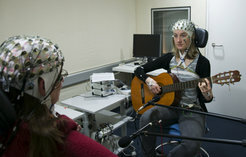 Their aim was to find out whether synchronisation of the brain waves would still occur when two guitarists are not playing exactly the same notes. If it did, this would be inconsistent with the assumption that similarities in brain activity between the two guitarists are entirely due to perceiving the same stimuli or performing the same movements. Instead, it would suggest something more spectacular: that the two brains synchronize to support interpersonal action coordination. To test this hypothesis, the psychologists assigned 32 experienced guitarists to 16 duet pairs and attached 64 electrodes to each of the musicians’ heads. This enabled the scientists to record the activity of the brain waves over different regions across the entire head. Then, the musicians were asked to play a rondo sequence from the Sonata in G major by Christian Gottlieb Scheidler a total of 60 times. Importantly, the two duet partners were given slightly different tasks: They had to play in two voices, and one of the two was assigned a leading role, ensuring that they both started at the same time and were keeping the same tempo. The difference between leader and follower was reflected in the electrical activity captured by the electrodes: “In the player taking the lead, synchronization of brain waves measured at a single electrode was stronger, and already present before to the duet started to play,” says Johanna Sänger, the first author of the study. This was particularly true for delta waves, which are located in the frequency range below four Hertz. “This could be a reflection of the leading player’s decision to begin playing,” Sänger thinks. The scientists also analysed the coherence between the signals from different electrodes attached to the duets’ heads. The result was remarkable: When the musicians had to actively coordinate their playing, that is especially at the beginning of a sequence, the signals from frontal and central electrodes were clearly associated – not only within the head of one player, but also between the heads of the duet partners. “When people coordinate actions with one another, small networks within the brain and, remarkably, between the brains are formed, especially when the activities need to be precisely aligned in time, for example at the joint play onset of a piece,” says Johanna Sänger. The current data thus indicate that interbrain networks connect areas of both brains that previously have been associated with social cognition and music production. And such interbrain networks are expected to occur not only while performing music. “We assume that different people’s brain waves also synchronise when people mutually coordinate their actions in other ways, such as during sport, or when they communicate with one another,” Sänger says.